Action from Yaxley's FA Cup win over Godmanchester. Last night the Cuckoos lost 4-0 in the league. There were defeats for all three local sides involved in United Counties League Premier Division action last night (September 2). In the top-of-the-table clash at Sleaford Town, the home side were convincing 4-0 winners against Yaxley and they now replace the Cuckoos at the summit. Both teams have 12 points from six games but Sleaford lead on goal difference. Ryan Anderson, Joe Smith and Ryan Oliver (2) were the Sleaford marksmen while Yaxley had Deakan Napier red-carded for dissent just before the interval. 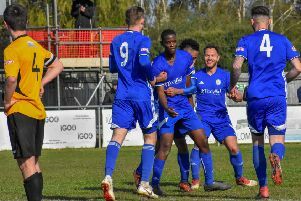 Peterborough Northern Star travelled to Harrowby United and were pipped 3-2 with the home side scoring their winner in stoppage time. Craig Smith got both Star goals. And completing a miserable night for the local sides, Huntingdon were walloped 7-0 at home by Kempston.